A good display product is versatile and dependable. Tradeshow displays must be able to handle the multiple roles they will perform throughout the years. Rugged, well designed hardware makes all the difference to the longevity of your display. When it comes to display choices, your options are endless. 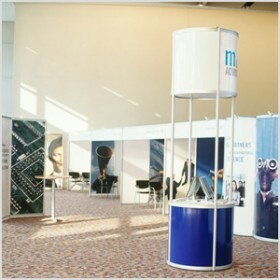 Pop-up displays are one of the most common tradeshow booth options. They are easy-up and easy-down – can you ask for anything more? Displays are used for more than just tradeshow applications. A dynamic display can give a showroom interest or add punch to a retail environment. At GVC, we have been designing and creating unique displays for over 15 years. Our designers and product managers understand what it takes to elevate a display from ordinary to unforgettable. We are here to work with you and can provide you with solutions that will fit with your corporate branding. When it comes to display options, we can help you create a custom exhibit, or decide to use one of our standard solutions. Let our in-house experts help you create a display that will differentiate your company in the competitive marketplace.